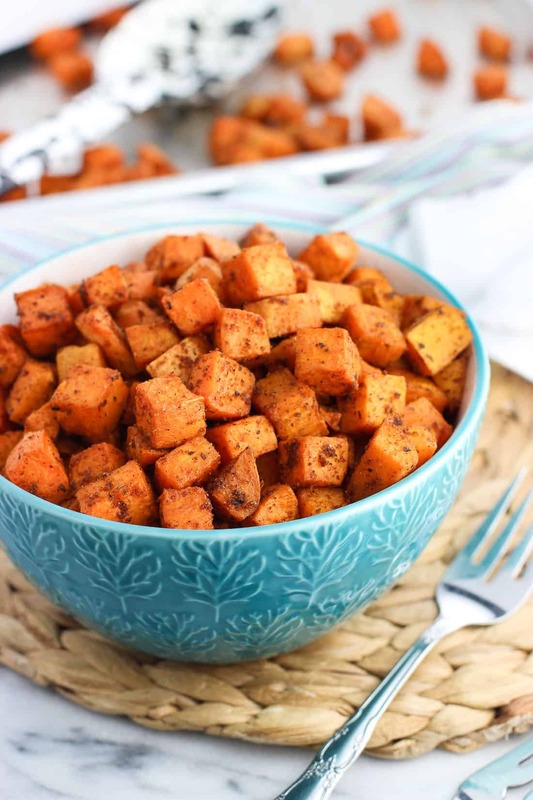 Easy oven roasted sweet potatoes make the BEST healthy side dish. Done in forty minutes or less, these sweet potatoes feature a zippy blend of spices and seasonings that pair well with a wide range of main dishes. If I told you that every time I make these spiced oven roasted sweet potatoes, I inevitably end up eating them cold from the fridge for breakfast the next day, do I need to tell you anything else? 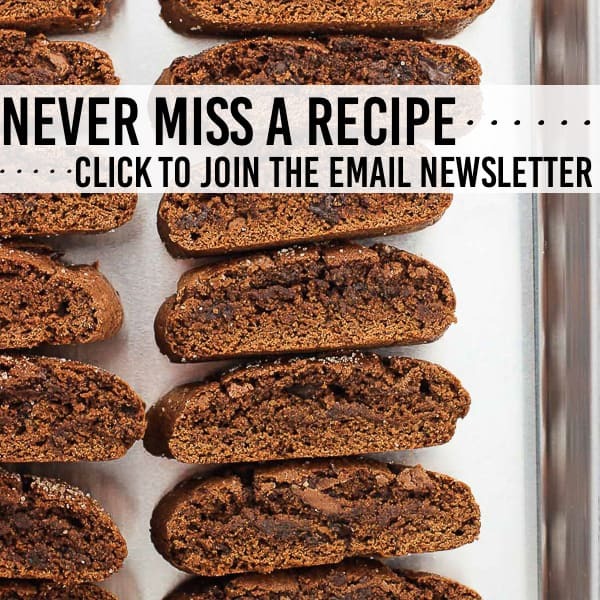 This recipe is a few years old now but in need of a photo refresh. Since I make these at least once a month, it was no sweat to take a few new glamour shots. Thankfully these spiced oven roasted sweet potatoes use kitchen staples and dried spices so they’re ready year-round! 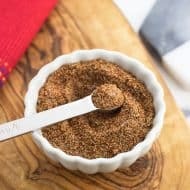 There are lots of different (but complementary) spices here, from easy breezy salt, pepper, and garlic powder to the more bold cumin, coriander, and cinnamon. 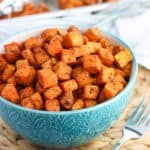 It’s no secret that I’m not a fan of sweet sweet potatoes (meaning the Thanksgiving-esque sweet potato casserole with marshmallows on top), but a little bit of cinnamon in savory oven roasted sweet potatoes? As for the liquid ingredients, we have olive oil, Worcestershire, liquid smoke, and sriracha. Kind of a mixed bag! The sriracha adds a mild zip (add more if you like things spicy spicy), with the liquid smoke bringing, well, the smokiness. Just one-and-a-half teaspoons adds a wonderful layer of flavor that helps make these sweet potatoes something special. One teaspoon of sriracha lends flavor, but doesn’t make these oven roasted sweet potatoes spicy. Add more sriracha if you’d like more zip! You’ll want to use your largest rimmed baking sheet here so as not to crowd in the sweet potatoes. The one you see in these pics is 13″ x 18″ aluminum (affiliate link) and never warps in the oven. 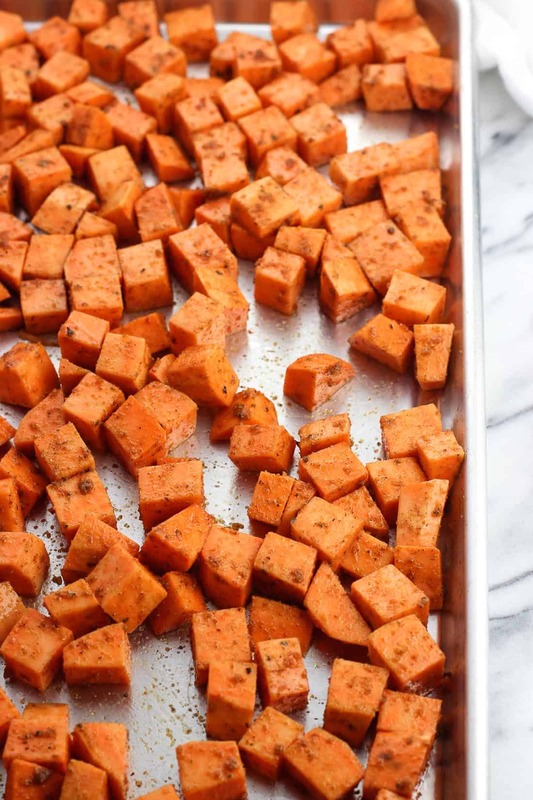 Easy oven roasted sweet potatoes make the BEST side dish. 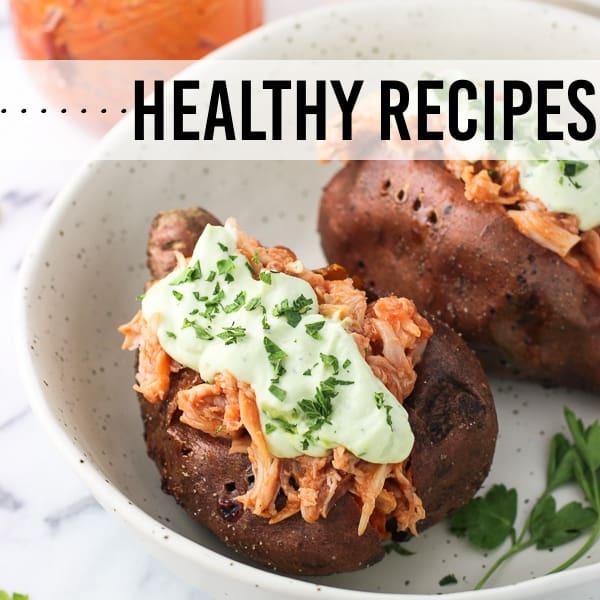 Done in forty minutes or less, these sweet potatoes feature a zippy blend of spices and seasonings that pair well with a wide range of main dishes. 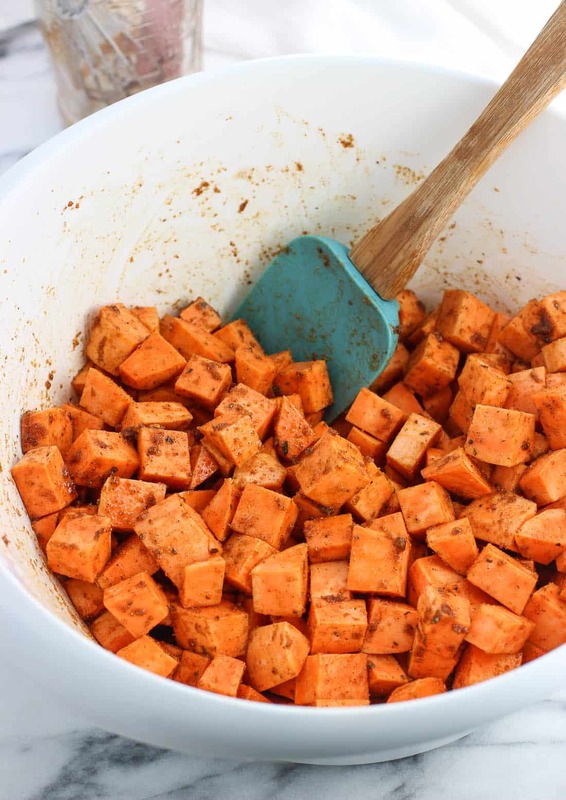 Scrub sweet potatoes, peel them, and cut into 1/2"-ish cubes. Add potato cubes to a bowl with all ingredients. Stir so that the wet ingredients evenly coat the potatoes. Pour all onto a large baking sheet (or two), taking care to arrange potatoes in a single layer. Bake for 25-35 minutes or until slightly browned around the edges, flipping potatoes halfway through. 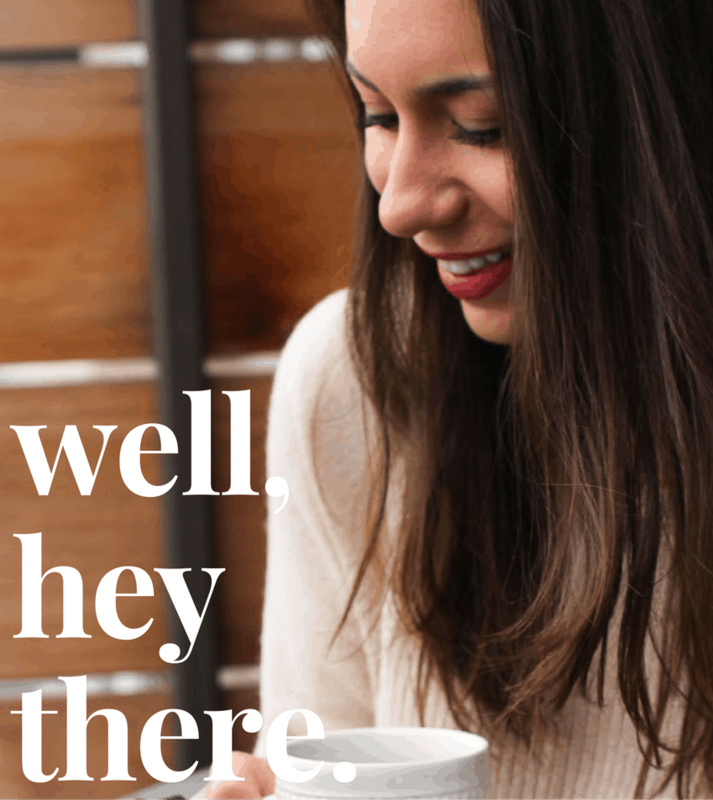 Bahaha… love that you snacked away on the cold leftovers in your PJs. 🙂 Its strange that potato is good cold huh?! Yum! These potatoes look perfect. I’m a big fan of bold flavors, so I know I’d love all the flavors you’ve got going here. And no judgement from me for eating cold potatoes straight outta the fridge. Sounds exactly like something I would do! I wouldn’t mind eating these straight from the fridge too! Looks so good, and I can imagine that ancho chili powder will be amazing here! 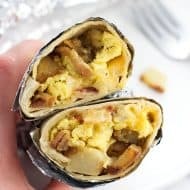 OK, so now you’ve got me craving these potatoes for breakfast! I’ve made something similar before but definitely didn’t go crazy enough with the spices. I especially love that you added cinnamon, Alyssa! Sweet potatoes are in my top 3 fave foods (right along w/ pizza and ice cream.) I can totally eat them out of the fridge too! Ohh! I love this! We eat sweet potatoes a lot but this is a totally different flavor combo than I am used to. It sounds amazing! Thanks Annie!! We haven’t eaten sweet potatoes this ‘spiced up’ before but it was a total winner in our book! Oooo, I love the idea of the ancho chili powder addition. And you know that Sriracha doesn’t scare me either! 🙂 Alyssa, I have to tell you…when I make these, I AM eating them for breakfast. In my PJs. Hahaha! Pinned! The spices in this just take these to a whole new level! Thanks Zainab! The more spices the better in this case! Thanks Kelly! Those spices definitely add a ‘kick’ to them. So good! Oh my gosh, I’m totally guilty of eating sweet potatoes cold right out of the fridge. They are the BEST, right?! 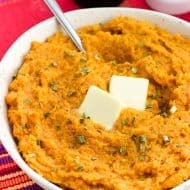 And mashed sweet potatoes with a bit of brown sugar and cinnamon…another fave. Delish! 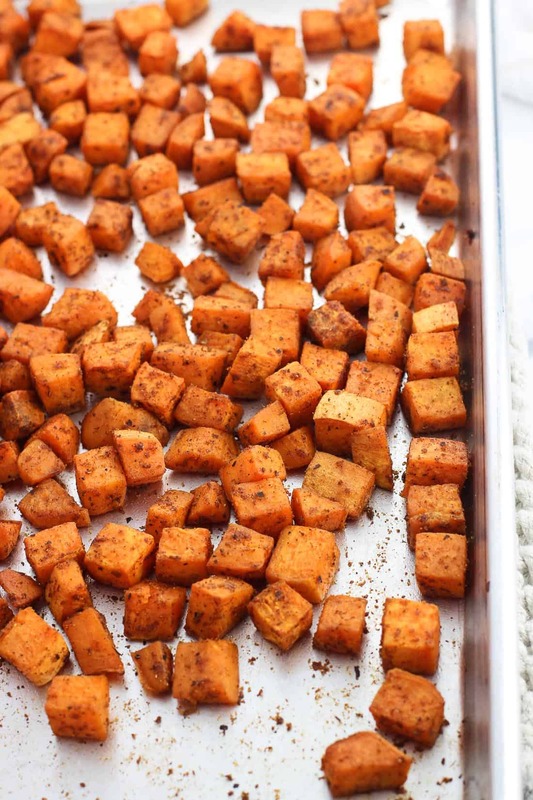 I’m addicted to sweet potatoes and I love how you spiced these roasted ones up! 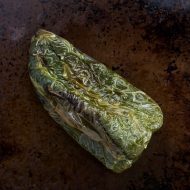 I roast mine like this and love them in a salad…I just find myself picking the sweet potatoes out and going for them first. 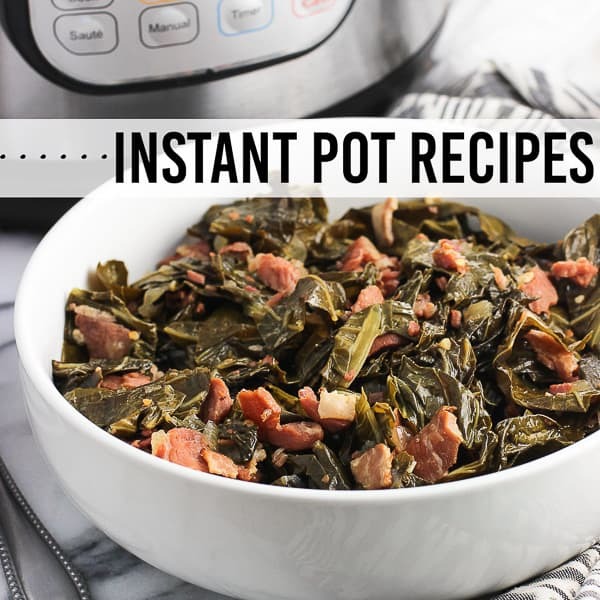 They really are good the next day, if there are any leftovers! i do love sweet potato! these bites look delicious.. love all the spice flavourings! Thank you Thalia! I love all those spices paired together, too. A great savory combination! Sweet potatoes for life!! haha they are one of my favorites! And I LOVE all the spices and flavors you have going on here. I sadly just used my last sweet potatoes – guess it’s time to head to the store! Thanks Arpita! I’m wishing we still had some around. They were totally addictive! Alyssa, I’ve lived in my current house going on two years and I still can’t get my pantry organized. I really don’t like it. It is deep, narrow and everything is hard to find. You have a system let me know. I need help! Sweet potatoes are my favorite potato. 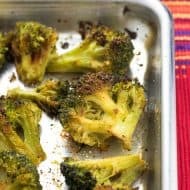 Spicy oven roasted sound amazing! I’d be eating these non-stop! Haha that does sound like a challenging pantry environment, Cindy. Our ceilings are really high, which isn’t something to complain about, except that a good portion of our pantry shelves are too high for me to reach standing on the ground (and I’m “average” height – 5’6). We actually have a step ladder we keep near the kitchen haha. Those sweet potatoes were stored on a tall shelf and I couldn’t even see the bag when looking up. That’s the last perishable item we put up there! I have only recently discovered cinnamon on sweet potatoes, but it is amazing, isn’t it! Dannii, cinnamon on sweet potatoes was a new discovery for me, too. You’re so right – AMAZING!! This is one of my FAV snacks! Love the spices you used Alyssa! Thank you Jessica! LOVE sweet potatoes! I love sweet potatoes! 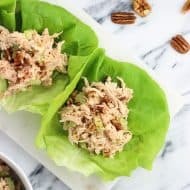 This recipe is healthy and delicious, a perfect combination. You mom is so cool and thoughtful! Great post today! Adore that the sweet potatoes were rescued from total demise and turned into a luscious treat! I’m dreaming of serving these marvelous beauties with eggs and kale.